Scholarship Information | The Founders Fund, Inc.
Students interested in obtaining a scholarship from the Founders Fund must submit a completed application in the spring of their senior year of high school. Students must speak with their Guidance Counselor for more information about applying. Each year, approximately 25 to 35 students from Collier County High Schools receive renewable annual scholarships from the Founders Fund helping them defray the cost of attending colleges, universities, vocational schools, and professional programs across the country. Scholarship grants are made for one year at a time. If the recipient maintains a 3.00 GPA, the grant is renewed each year until the student graduates from a two- or four-year college or university. It is the student’s responsibility to inform The Founders Fund of their grades and enrollment status. 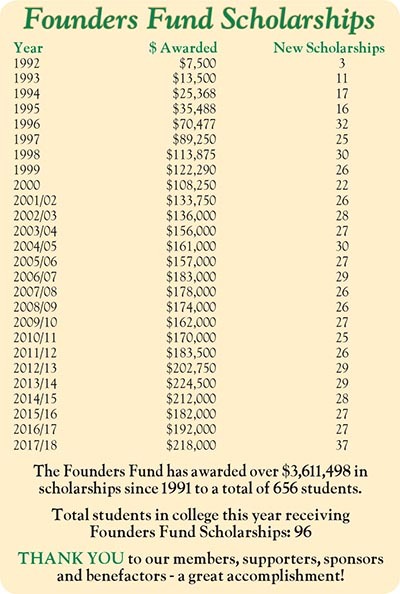 During any school year, approximately 100 students are receiving scholarships from The Founders Fund. Since 1991, scholarship recipients have received $2000 per year. Starting with the 2017 scholarship recipients, the scholarship amount will be increased to $2500 per year. Scholarship candidates are recommended by their high school Guidance Counselors, after which members of The Founders Fund Board interview the candidates. Students are selected for scholarship grants based upon their overall high school record, including extracurricular activities, academic performance, and the financial need of the candidate. Collier County, Florida, high school seniors with a 3.00 GPA and financial need may apply. Participating high schools are: Barron Collier, Community School of Naples, Everglades, Golden Gate, Gulf Coast, Immokalee, Lely, Lorenzo Walker, Naples, Palmetto, and St. John Neumann. Selection is based on academic merit and/or financial need. The selection process is guided by the following. A 3.0 weighted GPA for the past two years of high school. A minimum composite SAT OF 920 or ACT of 19. Gross family income is limited to 80% of the median family income of the residents of Collier County ($58,106) 80% = $46,484. There may be extenuating circumstances which allow the board to grant a scholarship when family income is above the stated ceiling, but not in excess of $75,000. These circumstances include, among others, a large family at home, other children presently attending college, financially burdensome medical problems, parents or providers unemployed, or other extenuating circumstances that gave rise to financial hardship. A copy of the first page of the most recent IRS Form 1040 must be attached to the application. Two written recommendations should be submitted with the application. One recommendation from a teacher and another from an adult (other than family member) well acquainted with the student. A parental letter is also requested. Participation in extra-curricular activities and community involvement. Personal interviews with applicants will be held at their respective high schools through arrangements with their Guidance Counselors.